With the Nexx X.R2, the best just got better. 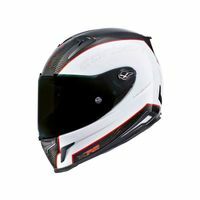 The two top vents are redesigned to increase airflow and reduce noise levels, carrying more fresh air directly to the forehead and interior of the helmet. The XR2 spoiler and aerodynamic profile reduce turbulence at high speeds. A race-ready flat face-shield has posts for tear-offs and Pinlock insert (both sold separately). The Easy Lock shield is more soundproof and airtight than its predecessor. The Nexx XR2 is a combination of technology, comfort and protection that helps you keep your mind on the road. $28 Promotional Gift Card available on this product!